Still dreaming of our Baltic cruise and can’t believe it’s over. Started in London at the fabulous “Taj Hotel.” If you want to be pampered, don’t hesitate to try it. Breakfast was included and quite delicious. Not to mention the location was perfect. 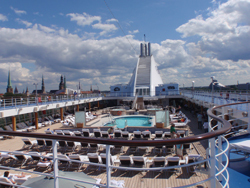 On to the Regent Seven Seas cruise on the “Voyager” to the Baltics. The ship with 700 guests was the perfect size and made it easy to get on and off at ports of call. Entertainment on the ship was first class and the food was never-ending. Meeting nice people was the norm at each stop and excursion guides were very enthusiastic. Thanks to Power Travel for a first class vacation! Seth and I enjoyed every second of every minute. Every detail was perfect. I am at a loss for words! I would recommend this exact itinerary to anyone I meet! First of all just wanted to say we are having a wonderful time. Lake Como is my new favorite Italian city :) We love the hotel and the cooking class was so fun today... It's already been one of our best family vacations and we are only on day two! THANK YOU FOR … CREATING THE PERFECT TRIP. Ryan and I have been reflecting on our time spent in Bali and we wanted to reach out and say thank you. You had a very large part in our amazing vacation. We so enjoyed our time in all three places in Bali and learned so much about the area and the culture. All of the staff at both of the Alila hotels was friendly and so helpful. Our rooms were beautiful and the grounds were incredible. We felt so grateful to be surrounded by such beauty. Thank you again for your time and help creating the perfect trip. THANKS SO MUCH FOR… GETTING US THOSE SPECIALS AND UPGRADES! I just wanted to let you know that our trip to Moorea and Bora Bora was amazing! Everything was great from accommodations to transfers. We loved it and definitely want to go back someday! Thanks so much for organizing everything and getting us those specials and upgrades! My husband, John, and I had an absolutely wonderful and unforgettable experience, due in no small part to Matilde Broder and her staff of Power Travel. Her expertise, patience, guidance, and recommendations, and the little extra touches she planned for us at every step of the way, combined to make this one of the most enjoyable travel experiences of our lives. We have already booked our next trip with them! THE El DORADO MAROMA WAS AMAZING!!!! ... PERHAPS BETTER THAN OUR HONEYMOON. I have a friend I recommended you to her she is looking to celebrate an anniversary. She has 4 children and is looking to escape as well. I mentioned the resort but not sure what she is looking for. Thank you again Christina! TURKS & CAICOS - THE SOMERSET AT GRACE BAY IS PARADISE FOUND! We returned from our trip on Thursday after spending a delightful 10 days away. The Somerset was a lovely place and our villa was beautiful. The last 2 days they ended up moving us to the 5-bedroom penthouse oceanfront villa in the same building and that was unbelievable! We had picture perfect weather on top of it all! And being able to walk to all the restaurants was perfect with 8 of us. Thanks for all your help. Should you want more details for a future client or the like please call me. Above: A view of the Somerset at Grace Bay. Below: Map of Turks and Caicos with marker on The Somerset at Grace Bay. Italy: venice, florence Sorrento and Rome!! We can't thank you enough for planning and organizing the best trip to Italy. We had an amazing time in Venice, Florence, Sorrento and Rome! the hotels were beautiful and very comfortable. The logistics of all the traveling and transfers were expertly arranged. Everything was easy, fun and so memorable. The tour guides both in Rome and Florence were a pleasure, so knowledgeable and interesting. Tim, the boys and I will have the best memories of our first trip to Italy. We can't wait to go back! 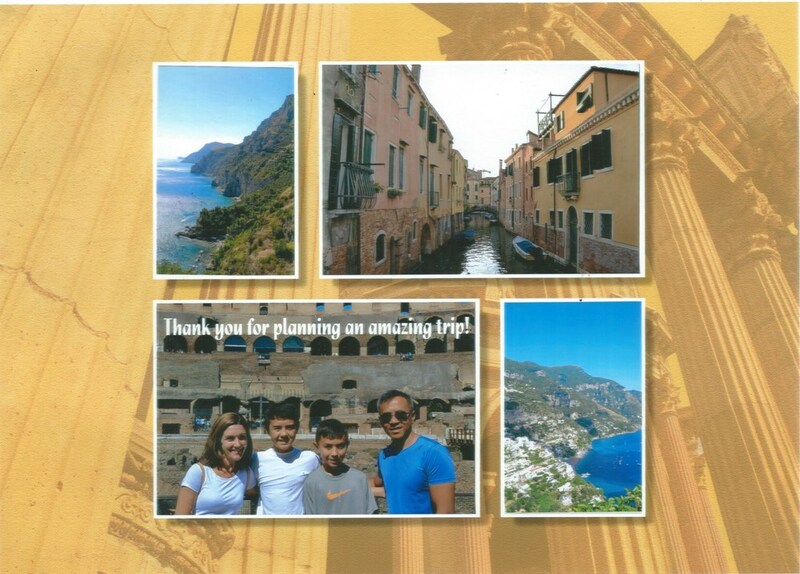 I just returned from a beautiful 12 days in Italy with my family, all organized by Power Travel. We are grateful that we received such warm and professional service from Matilde - over a period of maybe 6 months. Matilde listened to what our needs were, where we wanted to go, what our budget was - and created an incredible trip. Hotels - lovely and quaint - and perfectly located in the 3 cities we visited. Guides - we asked for some personalized tours in each city. The guides were excellent: professional, interesting, 1 was even a historian who had a never ending stream of little known facts. Local reps - Matilde organized locals to meet us at each airport/station - to ferry us around when necessary. Each one was prompt, friendly and warm. And finally, while we were IN Italy, we wanted to change some of our plans - and Matilde quickly responded to emails and handled our requests immediately. Matilde helped us create a truly wonderful family vacation - that we will never forget. I strongly strongly recommend her and Power Travel.